Participants receive the following perks! Want to register a team, running club, or group of 5 or more? Contact us for a group discount. Want to pay by check or mail in your entry? A discounted rate for youths under 18-years old that wish to participate in the 5K or 10K. Simply choose your distance category below. 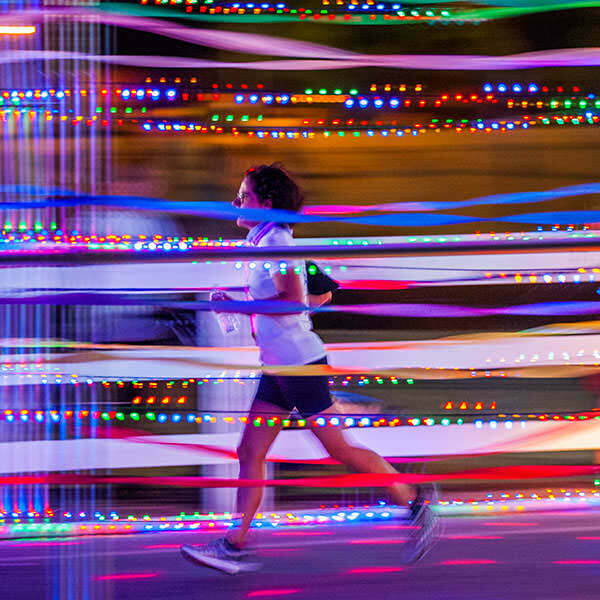 The Virtual option is for runners who are unable to attend the race in person, but still wish to support Be The Light 5K and earn the awesome medal, shirt, and swag. You can virtually run the distance where ever you are in the world. Simply register, run, and send us a photo showing your final time and we'll send your packet in the mail! Did you run/walk last year? Be The Light 5K is about supporting youths in recovery through the A Light of Hope charity. Help by donating more to the cause, 100% of your additional donations go to A Light of Hope. Thank you for your support! Thank you for making an extra donation to support A Light of Hope, every dollar helps make a difference. In consideration of the acceptance of my application for entry, I hereby freely agree to make the following contractual representations and agreements. I a person being over the age of eighteen, on my own behalf or on my minor child's behalf hereby enter this RELEASE OF LIABILITY, VOLUNTARY ASSUMPTION OF RISK AND INDEMNITY AGREEMENT (hereinafter, the "Release") with NEW GLOBAL ADVENTURES, LLC, A LIGHT OF HOPE SUPPORT CENTER, INC., its parent, all subsidiaries, related and affiliated entities including, but not limited to, NEW GLOBAL ADVENTURES, LLC., A LIGHT OF HOPE SUPPORT CENTER, INC., and all their officers, directors, members, partners, shareholders, employees, volunteers, agents, associations, sports disciplines, insurers, sponsors, facility, venue and property owners or operators upon which the Event takes place; law enforcement agencies and other public entities providing support for the Event; successors and assigns (Individually and Collectively, the "Released Parties"), in connection with my and/or my child's attendance at and participation in the Be The Light 5K event to be held in Valencia and Santa Clarita, CA on or about September 21, 2019, and all activities preceding and following such event (collectively, the "Event"). I fully understand that the Event involves known and unknown risks associated with physical fitness that participation in road running, race walking or running Events is inherently dangerous and represents an extreme test of a person's physical and mental limits, health risks associated with such physical activity, physical trauma, strains, bruises, muscle tears, broken bones and other conditions, any of which could cause serious bodily injury, including cardiac injuries and heart attacks, permanent disability, paralysis and death; loss of or damage to equipment/property; exposure to extreme conditions and circumstances; contact with other participants, spectators, animals or other natural or manmade objects; dangers arising from adverse weather conditions; imperfect course conditions; land, water and surface hazards; equipment failure; inadequate safety measures; participants of varying skill levels; situations beyond the immediate control of the Released Parties; and other undefined, not readily foreseeable and presently unknown risks and dangers ("Risks"). By my or my child's own actions or inactions or the actions or inactions of others participating in the Event, the conditions in which the Event takes place, or the negligence of the Released Parties, whether passive or active; and that there may be other risks either not known to me or not readily foreseeable at this time. I am voluntarily allowing myself or my child to participate in the Event, despite the known and unknown risks presented by my or my child's attendance at and participation in the Event. I fully understand that I should consult with a physician before participating in the Event or any other exercise program or before my child participates in the Event or any other exercise program. I know my or my child's capabilities and limitations and I or my child will not attempt to exceed those capabilities in attending and participating in the Event. THEREFORE, in consideration of me or my child being permitted to attend and participate in the Event, I expressly and freely agree: 1. I understand that I or my child will be alone on remote trails, without means of immediate communication, transportation, or medical support. I understand that participation includes the risk of serious injury and death and that New Global Adventures may hire personnel for minor first aid, but will not be providing ambulances, doctors or otherwise providing any guarantee of emergency services for a life-threatening episode. 2. To ASSUME ALL RISK of serious personal injury, including death, and/or damage to or loss of real or personal property and to assume all responsibility for losses, costs and damages I or my child may incur, where such risks or losses arise from or are in any way connected with my or my child's attendance at, preparation for or participation in the Event. 3. To RELEASE, WAIVE and FOREVER DISCHARGE any and all claims, liabilities, loss, demands, damages, costs, expenses, lawsuits, causes of action and judgments that I or my child now or hereafter may have or claim to have against the Released Parties resulting from, arising out of or in any way connected with my or my child's attendance at, preparation for or participation in the Event or any related event, including but not limited to, any claims or damages for personal injuries, including death, and/or damage to or loss of real or personal property, whether caused in whole or in part by the NEGLIGENCE AND/OR FAULT of the Released Parties, whether passive or active (excluding gross negligence or intentional torts) or any entity or person(s) performing any function with respect to the Event. 4. To INDEMNIFY, DEFEND, and HOLD HARMLESS the Released Parties, from any and all claims, liabilities, loss, demands, damages, costs, expenses (including attorneys' fees), lawsuits, causes of action and judgments for personal injuries, including death, and damage to or loss of real or personal property, whether foreseen or unforeseen, present or future, known or unknown, resulting from, arising out of or in any way connected with my or my child's attendance at, preparation for or participation in the Event, whether caused in whole or in part by the NEGLIGENCE AND/OR FAULT of the Released Parties, whether passive or active (excluding gross negligence or intentional torts) or any entity or person(s) performing any function with respect to the Event. I further agree that if, despite this Agreement, I, or anyone on my behalf, makes a claim for Liability against any of the Released Parties, I will indemnify, defend and hold harmless each of the Released Parties from any such Liabilities which any may be incurred as the result of such claim. 5. That I am or my child is in good health and there are no physical conditions that would or should prevent me or my child from attending, preparing for or participating in the Event. 6. I hereby expressly waive any and all rights I or my child may have under Section 1542 of the Civil Code of the State of California, which states: "A general release does not extend to claims which the creditor does not know or suspect to exist in his or her favor at the time of executing the release, which if known by him or her must have materially affected his or her settlement with the debtor." 7. That I do hereby grant the Released Parties the irrevocable right and permission to photograph or otherwise record me in connection with the Event, and to use the photograph or recording ("Photograph") for all purposes, including advertising and promotional purposes, in any manner in any and all media now or hereafter known, in perpetuity throughout the world, without restriction as to alteration. I waive any right to inspect and approve the use of the Photograph, and acknowledge and agree that the rights granted by this Release are without compensation of any kind. I acknowledge and agree that I have no right, title or interest in the Photographs and agree that such Photographs and the copyright therein are the exclusive property of the Released Parties. I agree to release and discharge the Released Parties from any claims, actions, damages, demands, costs, expenses (including attorneys' fees) or lawsuits of any kind (excluding gross negligence or intentional torts) by reason of the sale, distribution or use of such photographs or recordings. 8. That this Release is intended to be as broad and inclusive as permitted by law, and that if any term or provision of this Release shall to any extent be held invalid or unenforceable, the remaining terms of the Release shall not be affected thereby, but shall be valid and enforceable to the fullest extent permitted by law. The invalid provision shall automatically be replaced by a substitute provision which is valid and as nearly as possible maintains the same economic purposes and intention of the valid provision. This Release shall be interpreted in accordance with the laws of the State of California. I agree that any dispute regarding the enforceability of this Release shall be filed in the courts of the State of California, and shall not be transferred to any other state. 9. That the terms and conditions contained in this Release shall be binding upon me or my child and my or my child's family members, legal representatives, executors, heirs, next of kin, successors, beneficiaries and assigns. 10. That I am eighteen years of age or older and have the authority to contract in my own name. To the extent I am signing this on behalf of my child, a minor, I represent that I have the legal capacity to enter into this Release on his or her behalf. 11. I understand that the entry fee is non-refundable and non-transferable. I a person being over the age of eighteen, on my own behalf or on my minor child's behalf hereby enter this RELEASE OF LIABILITY, VOLUNTARY ASSUMPTION OF RISK AND INDEMNITY AGREEMENT (hereinafter, the "Release") with NEW GLOBAL ADVENTURES, LLC, A LIGHT OF HOPE SUPPORT CENTER, INC., its parent, all subsidiaries, related and affiliated entities including, but not limited to, NEW GLOBAL ADVENTURES, LLC., A LIGHT OF HOPE SUPPORT CENTER, INC., and all their officers, directors, members, partners, shareholders, employees, volunteers, agents, associations, sports disciplines, insurers, sponsors, facility, venue and property owners or operators upon which the Event takes place; law enforcement agencies and other public entities providing support for the Event; successors and assigns (Individually and Collectively, the "Released Parties"), in connection with my and/or my child's attendance at and participation in the Be The Light 5K event to be held in Valencia and Santa Clarita, CA on or about September 21, 2019, and all activities preceding and following such event (collectively, the "Event"). I fully understand that the Event involves known and unknown risks associated with physical fitness that participation in road running, race walking or running Events is inherently dangerous and represents an extreme test of a person's physical and mental limits, health risks associated with such physical activity, physical trauma, strains, bruises, muscle tears, broken bones and other conditions, any of which could cause serious bodily injury, including cardiac injuries and heart attacks, permanent disability, paralysis and death; loss of or damage to equipment/property; exposure to extreme conditions and circumstances; contact with other participants, spectators, animals or other natural or manmade objects; dangers arising from adverse weather conditions; imperfect course conditions; land, water and surface hazards; equipment failure; inadequate safety measures; participants of varying skill levels; situations beyond the immediate control of the Released Parties; and other undefined, not readily foreseeable and presently unknown risks and dangers ("Risks"). By my or my child's own actions or inactions or the actions or inactions of others participating in the Event, the conditions in which the Event takes place, or the negligence of the Released Parties, whether passive or active; and that there may be other risks either not known to me or not readily foreseeable at this time. I am voluntarily allowing myself or my child to participate in the Event, despite the known and unknown risks presented by my or my child's attendance at and participation in the Event.